Create personalized social links for every customer interaction. All of your favorite content at your fingertips. Save links to your favorite social content for quick access using our native mobile app. Social share links combine call-to-action overlays, personalized titles and custom messages all rolled into an easy-to-share short link. Each short link is saved to your personal social link list for easy access and quick sharing. All of your social link sharing and prospect activity is updated in real-time and displayed in your Activity Feed. 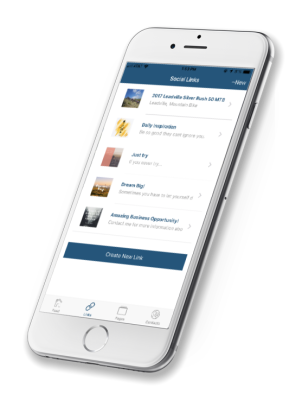 Sharing to your favorite social networks is easy with our native mobile app. 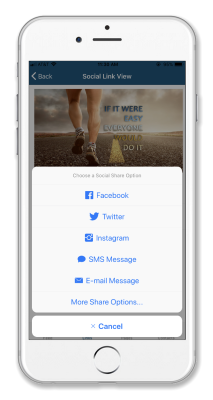 Simply pick the social link from your list and share directly to any social app installed on your device with all of the information pre-populated for you. Do you have a favorite opportunity video or product page you like to share with new prospects? No more trying to remember the website url. Easily share saved social links with your prospects using your favorite messenger app such as Facebook Messenger or by using SMS and e-mail.